From April 16-23, enjoy a PEEPtastic celebration with free PEEPS brand marshmallow samples, PEEPS-inspired menu items, PEEPS décor, and Easter-themed activities. At check-in, guests will receive PEEPS marshmallow chicks , and the fun continues with special appearances by the Easter Bunny (he’ll give you PEEPS, too!). Sweet treats will follow with PEEPS-inspired menu items featured at several of the hotel’s restaurants. Look for s’mores made using PEEPS, a PEEPS inspired milkshake, and chocolate-dipped PEEPS! A favorite for kids — the resort’s annual glow-in-the-dark Easter egg hunt headlines a full schedule of Easter-themed activities at the hotel, including traditional Easter egg hunts, Easter egg races, a bunny hop relay, arts and crafts, and meet-and-greets with the Easter Bunny. Peep decor will include larger than life PEEPS and several 3-foot, 50-pound white chocolate sculptures around the resort. 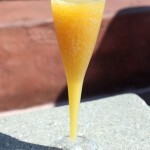 You won’t want to miss the Easter dinner buffet at Garden Grove restaurant! 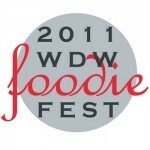 Disney characters will be featured at this special meal on April 20th at 5PM. Cost is $39.99 for adults and $19.99 for kids 3-9 years old. Under 3 are free. 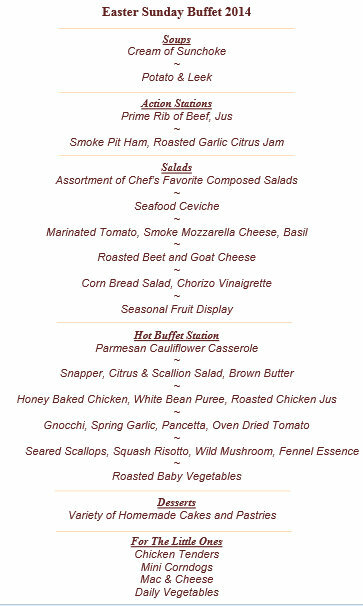 Note that an 18% gratuity will be added. The fun continues with a campfire, glow-in-the-dark family volleyball game night, and a poolside showing of HOP!! 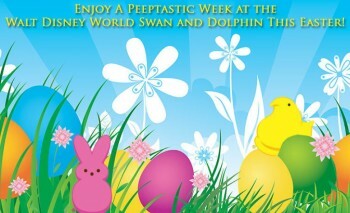 If your ears are perked up now, get more details at www.swandolphin.com/easter. To make room reservations, call 1-800-227-1500 and mention “PEEPS.” Overnight rates start at $189 per night. Have you stayed at Swan and Dolphin? 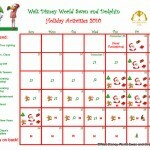 Experienced any of their special holiday events? Let us know in the comments below! 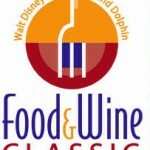 Menu Announced for the Swan and Dolphin Food & Wine Classic! peeps are one of those things that are amusing because they are so disgusting. Peeps always look adorable! As to taste, too many people try to eat them unripe. Let a box sit open for a week (longer if the weather’s humid), and they turn into chewy, sweet goodness. 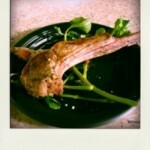 Garden Grove for Easter dinner was a tradition for us for several years. We have great family pics of us there with Chip and Dale. Sadly, no Easter Wdw trip for us this year. OK, after my (above) declaration of love for Peeps, I went to Swan & Dolphin to check out this event April 19, the day before Easter. But we saw no sign of Easter anywhere. No displays, no sculptures–no Peeps. We even checked the menus at the cafes for the Peeps milkshakes, s’mores and other treats, but found nothing. So we went to the Dolphin front desk and, indeed, there was a small basket of mini Peeps on the counter. However, when I asked about the displays of white chocolate sculptures and larger-than-life Peeps, the concierge looked at me like I had three heads with bunny ears. After asking the other concierges and making a phone call, she told us that no one knew anything about the Easter displays, but that the Easter Bunny had visited “earlier.” According to signage, the busy bunny showed up in a conference room from 11 a.m. to noon and 4 to 5 p.m. Since it was 5:30, we missed out. Kimberly — Oh my goodness! I’m so sorry you had this experience! I wonder if it was just on Easter?? I wondered that too! We LOVED the chefs’ chocolate egg creations at Grand Floridian, though, and the White Chocolate Raspberry bunny cupcake at Hollywood Studios. Not to mention the new mac & cheese at Friar’s Nook in Fantasyland (blue cheese balsamic was delish!). Thanks for all the great info!